GRPL 287, May 10, 1957, K 4767. An ad in the Press on Saturday, June 25, 1938, p. 9, refers to "the new" Vogue theatre. The theater had originally been known as the Michigan Street Vaudette, and was first listed in the city directory in 1916. The name was later shortened simply to the Michigan. 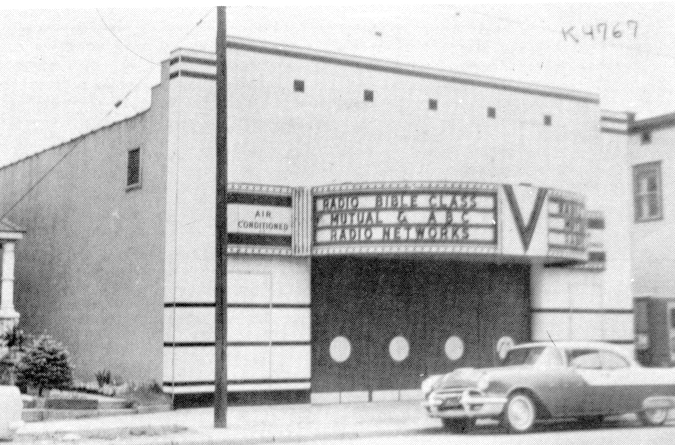 The Vogue was still listed as a theater in the 1948 city directory, having been purchased by Herbert R. Boshoven from Howard T. Reynolds in late 1945 or early 1946 along with the Family and the Stocking for $135,000. By 1948, however, it had been purchased by the Radio Bible Class, an affiliate of Calvary Undenominational Church and Rev. Martin R. DeHaan, which was the owner when the building was listed for sale for $44,900 in 1957. Situated on a 40' x 125' lot, it had 9,000 square feet of floor space and had been divided into four private offices. Ceiling height on the main floor was 20', and in the basement 9'. An oak floor had been built. The brick and concrete block building was heated by an oil furnace and a forced-air system, had an asphalt roof, and was in excellent repair. Men's and ladies' restrooms were available. For some years the building has been occupied by the Wing On Restaurant.